Apple’s iPad event was pretty unsurprising. It was obvious that the large one would be speed-bumped and get lighter. It was also obvious that the Mini would get retina at some point – the only question was whether the supply chain could deliver enough panels now (with some well-informed people suggesting it could not), and the late-November ship date and $400 price point to how close it was. The lack of fingerprint scanning in both the new models was a surprise – it may again be a supply problem, but it means that any platform play Apple has in mind (ie payment) will have a smaller install base to launch onto. However, the big puzzle is the price the now old Mini is discounted to: $300. This compares poorly to a new Nexus 7, with comparable resolution to the retina Mini, at $230. The Nexus 7 is of course being sold at very low margin by Google, but does the old Mini really need to be $300 rather than, say, $275 or $250? What is Apple thinking? On a simplistic level, Apple’s tablet market share is clearly shrinking. The chart below, taken from a presentation I’ve been giving in the Bay Area this week, shows my estimates of tablet unit sales. (They’re in increasing order of certainty as you go from top to bottom. Kindle Fire is not included, since I lack the grounds to do quarterly estimates, but obviously it is not relevant outside the USA and a few other markets). Apple’s recent sales decline is largely a product cycle issue, but clearly, sales of other tablets are growing fast. And yet Apple is allowing the price window underneath the iPad to become meaningful. Why? 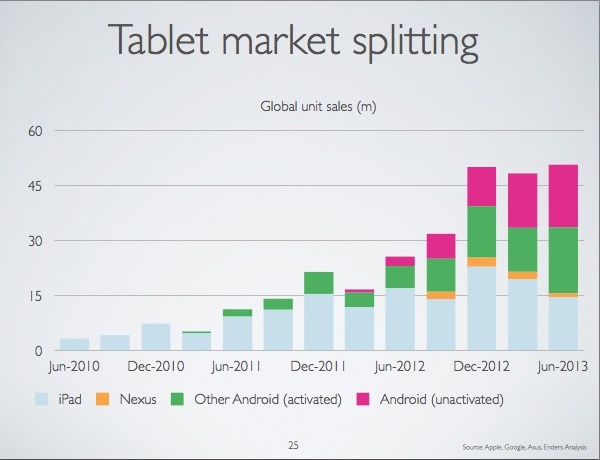 To me, the really interesting thing about this chart is how small Nexus sales are. Here is a good device with a nice clean Android install, sold at a very aggressive price. On Google’s own numbers, almost no-one buys it. Why? Why do sales of the Nexus 10 appear to be under 1m units? Meanwhile, every single data set shows iPad with at least three quarters of tablet use, be it app installs, web use or any other third-party engagement metric you want. Where are all those other, non-Nexus Android tablets? What’s being done with them? What seems to be happening is that if you want the post-PC vision that Apple and Steve Jobs created, you probably buy an iPad, and Apple has a large majority of that market, and hence of the use of devices for that purpose. This isn’t very surprising: the Android tablet app offer remains far behind the iPad in a way that the Android phone app offer does not. But there’s also another proposition, a $75-$150 black generic Chinese Android tablet, half the price of a Nexus 7. That proposition is also selling in huge numbers, but it appears to come with a very different type of use. Why are people buying these? What are they being used for? They’re mostly in China (that’s the pink bar above) and emerging markets and in lower income groups in the west. And it seems that they’re being used for a little bit of web, and a bit of free gaming. Perhaps some book reading. And a LOT of video consumption. In fact, one might argue that for many buyers, these compete with TVs, not iPads, Nexuses and Tabs. But regardless of what they’re being used for, they’re not being used the way iPads are used. In effect, they are the featurephones of tablets. If this theory is correct, it suggests that Apple’s $300 Mini really isn’t a competitive problem, because the iPad doesn’t yet face a strong competitive threat (quite unlike the iPhone). Rather, there are actually two quite different markets: the post-PC vision, where Apple is dominant, and a ultra-low margin product that’s also called a tablet but which is really a totally different product.